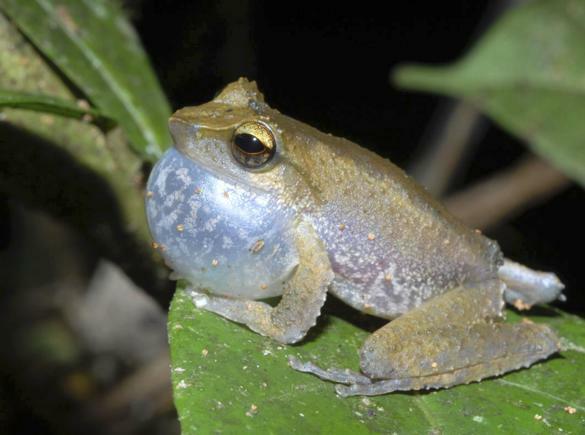 The Litoria frog uses a loud ringing song to call for a mate. Litoria is a genus of Hylidae tree frogs native to Australia, the Bismarck Archipelago, the Solomon Islands, New Guinea, the Lesser Sunda Islands, the Moluccan Islands, and Timor. They are sometimes collectively referred to as Australiasian treefrogs. They are distinguishable from other tree frogs by the presence of horizontal irises, no pigmentation of the eye lid and their Wallacean distribution. Several new species are described every year on average, by 2010 the number of known species is likely to exceed 150. This frog was found on a RAP survey, at the headwaters of the Strickland River, in the Southern Highlands Province of Papua New Guinea.